Chef Peter Mundy has over 20 years’ experience as a professional chef and this, his showcase restaurant, is the distillation of all that experience, knowledge and passion. Trained in Classic French and Modern English cuisine by renowned chef Paul Groom, Peter has developed his own style and passion for creating great dishes. Peter’s ethos is to work with local suppliers and to use the best fresh, seasonal, locally sourced ingredients. He and his team create wonderful dishes, exacting in their standards of presentation and with his trademark delicate combination of flavours and good size portions, you can taste the passion in his dishes. 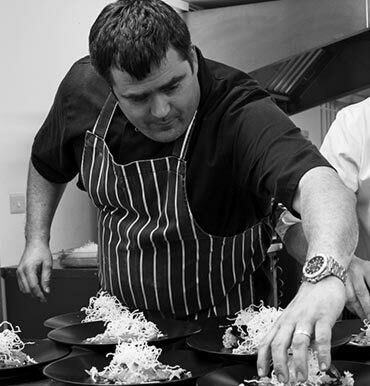 Peter Mundy at the Ginger Peanut is an exciting new venture for this talented chef where he will combine classic English and French cuisine with a modern twist to create a wonderful dining experience. Peter and his team look forward to welcoming you to this intimate restaurant with a big heart located in the centre of Bampton. Eggs, 2 Rashers of Dry Cured Bacon, Premium Pork Sausages, Flat Mushroom, Vine Ripened Cherry Tomatoes, Sautéed Potatoes, Baked Beans, Award Winning Black Pudding, Toast. Served with a Complimentary Tea or Filter Coffee. Eggs, Rasher of Dry Cured Bacon, Premium Pork Sausage, Flat Mushroom, Vine Ripened Cherry Tomatoes, Sautéed Potatoes, Baked Beans. Served with a Complimentary Tea or Filter Coffee. Smoked Salmon with Scrambled Eggs with Toast. "Epic meal, totally outstanding flavours. Lovely setting, calm atmosphere, superb service." "Perhaps THE best steak I''ve eaten in Devon !! Every ingredient in my meal was bursting with freshness and flavour-an utter delight." "Fabulous place, fab food and beautiful restaurant." "Top 20 New Hotels around the UK, 2018"
"We had the MOST delicious meal at this stunning restaurant." "Stopped for coffee, first class, so good we returned for lunch. Stylish restaurant,impeccable service." "Perfect. Irresistible food choices and bedrooms so comfortable you'll be tempted to stay there all day." "We enjoyed a beautiful meal, possibly one of the best we've ever had, anywhere in the world! We really didn't expect this level of sophistication." "This new Devon boutique hotel. Power showers, really fast WiFi, great food in the restaurant downstairs. Would definitely recommend." "This place is such a surprise..The finishes scream luxury and style." "So happy to have such a great new restaurant! Highly recommended. Friendly staff, delicious food, stylish setting. Looking forward to many more meals/parties there."